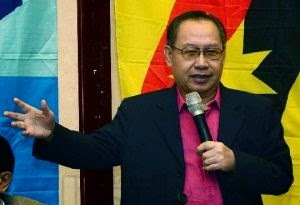 Sabah Umno leaders should emulate their Barisan Nasional (BN) colleagues in Sarawak who are doing a better job fighting for their state's rights under their respective Malaysia Agreements, said the head of opposition Sabah State Reform Party (STAR) Datuk Dr Jeffrey Kitingan. He said it was time for Sabah Umno and BN leaders to "prove themselves as national patriots" by protecting the rights and interests of Sabah and Sabahans in accordance with the formation of Malaysia. "Sabah Umno BN leaders have largely remained inelegantly silent on the basis of the formation of Malaysia. Those who have spoken are nothing more than parrots repeating the lines and the lies of the federal leaders," Kitingan said in a statement today. They were in stark contrast to Sarawak BN leaders, whom Jeffrey said had been "more forthright and have articulated correctly" the rights of their state and Sarawak's position as an equal partner in the federation of Malaysia. “Sabah BN leaders do not deserve to be called Sabah leaders for their treachery and contempt in mistreating and failing to defend Sabah rights,” he said. Kitingan added that he supported the call by Sarawak cabinet minister Datuk Seri Dr James Masing that those who distort history be charged with sedition. He said Sabah Umno leaders had to stop distorting historical facts about Sabah if they wanted to "redeem their place" as state leaders. Kitingan has been vocal about what he said were attempts to change Sabah's history as a sovereign entity which formed Malaysia of its own free will. He has taken issue with the removal of key words on the Batu Sumpah or oath stone, which commemorates the terms under which Sabah formed Malaysia with Sarawak and Malaya. The words removed were "Kerajaan Malaysia Jamin (the Malaysian Government guarantees). “By removing the key words, the government can now say that they do not guarantee that religious freedom and natural resources belong to Sabah and the safeguarding of native customs, adat and traditions," Kitingan said previously. The oath stone is placed within the compound of the Keningau District Office, and Kitingan's recent attempt to celebrate Malaysia Day on September 16 with a ceremony at the stone was prevented by the authorities. He is now calling for the oath stone to be relocated and rebuilt as a national monument. Kitingan said federal leaders should listen to the grievances and unhappiness of the people in the Bornean states and not create misinformation on the rights of Sabah and Sarawak. Putrajaya also should not make threats and false accusations against the people there who are voicing their dissatisfaction, he said. Putrajaya recently began investigations into talk of secession by these two states and on a Facebook page called Sabah Sarawak Keluar Malaysia (SSKM), with the Home Minister warning that action would be taken under the Sedition Act. – September 21, 2014.